A brief introduction of the modified Young's equation for nanodroplets. The contact angle, between the liquid-gas interface and the solid surface is used to describe the wetting property. 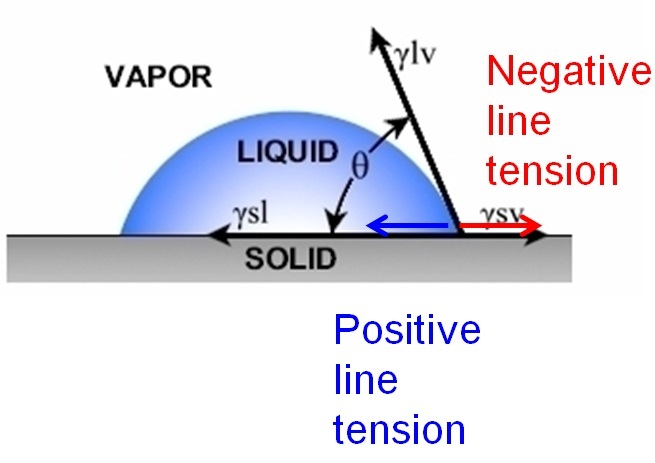 Form thermodynamic and mechanical point of view, the contact angle is a balance between the surface tensions of solid-liquid, liquid-vapor, and solid-vapor. This relationship is the well-known Young’s equation. Till now, the sign and magnitude of line tension remain controversial in literature. We have obtained some results for Argon, water and salt water nanodroplets. Hopefully our results will be published this year.